The lid has been lifted on the Nvidia GeForce GTX 690. It's undoubtedly the fastest graphics card on planet. And it's priced at an utterly offensive $1,000. That means that in the UK buyers should be looking at roughly £700 - still a whopping amount - but UK enthusiasts are actually going to have to pay £830 for this dual-GPU monster. This is offensive not because it rules out the vast majority of the PC gaming population. That, I'm afraid, is life. Porsche prices me out of the wonderous 911 GT3 RS 4.0 to the tune of about £120,000. I make do with a battered Boxster worth perhaps five per cent as much. The thing is, the RS 4.0 has some seriously high end hardware. And I'm not sure you can say the same of the GTX 690. It's based on a pair of GTX 680 chips in tag teaming SLI configuration. The GTX 680 is the fastest single GPU you can buy, so a pair of them makes this very likely the quickest dual-GPU board on the market. I haven't tested a 690 yet, but I'm happy to go along with the performance claims. But here's the rub. The GK104 chip that underpins both the 680 and 690 boards is not a high end chip. In fact, at around 300mm2 it's actually smaller than Nvidia's old mid ranger found in the GeForce GTX 560 which measured 360mm2 and can be had for as little as £150. 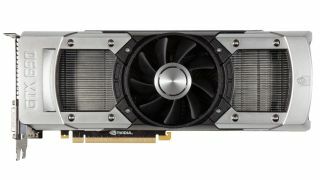 The GTX 580 – a pukka flagship beast - weighed in well over 500mm2. It's very likely Nvidia has a high end graphics chip derived from the same architecture as GK104. And it's almost definitely much, much larger. Some rumours suggest Nvidia has had problems getting it working. Just as likely, Nvidia hasn't released it because it doesn't need to. As things stand, it turns out GK104 is good enough to beat all comers. So Nvidia finds itself in the very happy position of being able to sell a mid-range chip at high-end prices. Given that GK104 is smaller than the chip it replaces, the profit margins must be pretty spectacular. Now, I fully realise that Nvidia is not a charity. It every right to price its products however it wants. And in the short term, pricing GK104 in the stratosphere probably makes sense. But equally, I've every right to be offended that Nvidia isn't passing on at least some of the fruits of its success to loyal customers. More to the point, I'm not convinced it's necessarily the right thing to do commercially. Currently, GeForce GTX 680 boards are priced around £400 and up with the GTX 690 likely to hit £700. The number of potential customers thin out very rapidly indeed at that level. Hardly anyone buys £400-plus graphics cards. Equally, those super-high stickers also leave plenty of room for Nvidia's main rival AMD to operate. Admittedly, the graphics chip inside an AMD Radeon HD 7970 measures over 350mm2 and it's not as fast as GK104. But there's plenty of room under £400 to sell 7970s and make money. What I'd like to see is GeForce GTX 680 at under £250, which is the price point the GK104 chip would have originally been aimed at before Nvidia realised AMD had under delivered this time around, and stick the GTX 690 up at around £400. They'd sell a shed load – of 680s, at least - and really put the pressure on AMD, which would struggle to make money out of a bigger but slower chip if it was forced to push its pricing down towards £200. It's particularly odd given that the high end PC segment is currently in decline as all the attention – and money – shifts to mobile computing devices including tablets and smartphones. Why not remind punters what a great platform the PC is by offering fantastic, console-crushing technology at prices they can actually afford? As it is, the new Nvidia GeForce GTX 690 and its single-chip GTX 680 sibling are pretty much irrelevant.